Migrate Outlook 2011, 2016 Mac OLM to PST, MSG, EML files using Outlook Mac Exporter tool. The application is built to simplify the conversion OLM file into Unicode type PST format in Microsoft Outlook 2016, 2013, 2010, 2007, 2003 versions in Windows OS. Complete Profile Conversion: Emails, Contacts, Calendar etc. The MS Outlook 2011 OLM to PST converter tool can be executed on all Microsoft Windows Operating systems namely, Windows 10, Windows 8.1, Windows 8, Windows 7, Windows Vista and all other below versions. Get complete profile data from Outlook for Mac to Outlook for Windows. Outlook Mac Email export utility ensures you to choose the required items that need to be migrated from OLM to PST with the help of checkboxes provided against all files and folders. OLM file can be imported on Windows with the help of Outlook Mac Exporter. Before exporting OLM file into Windows, the application allows a preview of complete profile data earlier you migrate Outlook 2011 Mac to Outlook PST format. Outlook OLM files to .msg migration feature multiple conversion options, one of which is OLM to MSG conversion. 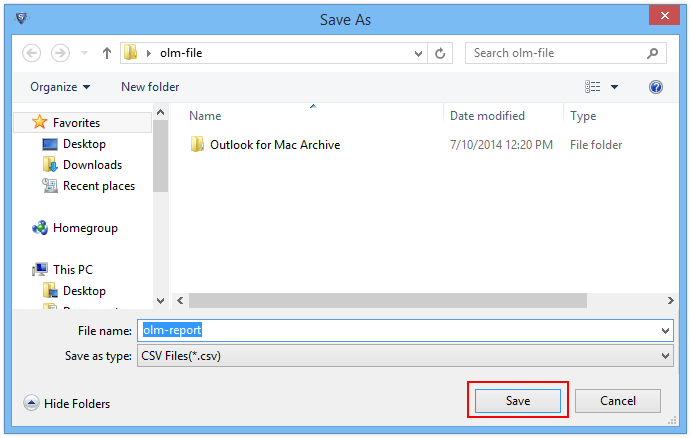 You can save items of the Outlook 2011 data file in a single file by selecting MSG file for the process. An MSG files can save emails, contacts, calendar, etc. In order to store only emails and as a single file for each message, then choose EML format. With the help of this OLM to PST Converter software, you can create a single copy for every email converted from OLM to EML format. This EML will be compatible with all supported platforms. Outlook 2016, 2011 for Mac data file, when converted to PST format can be split into multiple parts. Convert Outlook Mac emails into PST with an additional supporting feature of dividing the output file by size as per the user’s preference for maintenance purpose using Outlook Mac Exporter tool. Another supporting option featured by the software is naming convention option. The Outlook OLM Migration Software lists a number of predefined naming patterns based on mail subject, date, and so on when exporting Outlook OLM file to PST, EML or MSG in Windows. How to Export OLM File Using Outlook Mac Exporter Tool? 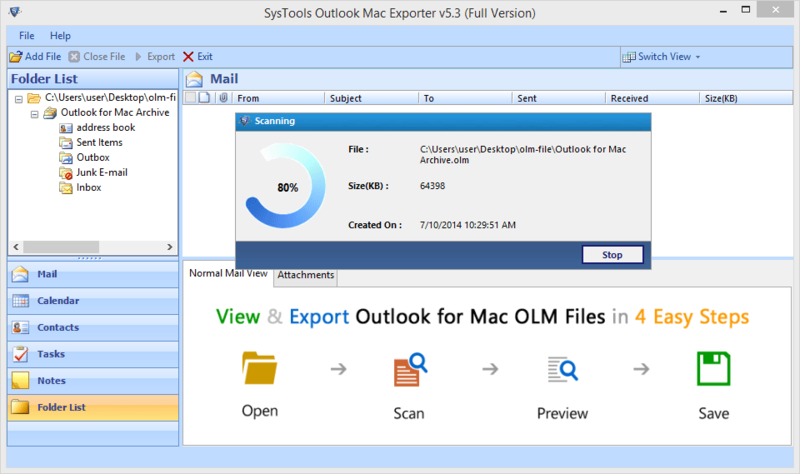 Step 1 : Open Outlook OLM to PST Converter for MAC Transfer Tool. Step 2 : Click on "Add File" Option to join the .olm file from its storage location in the system. 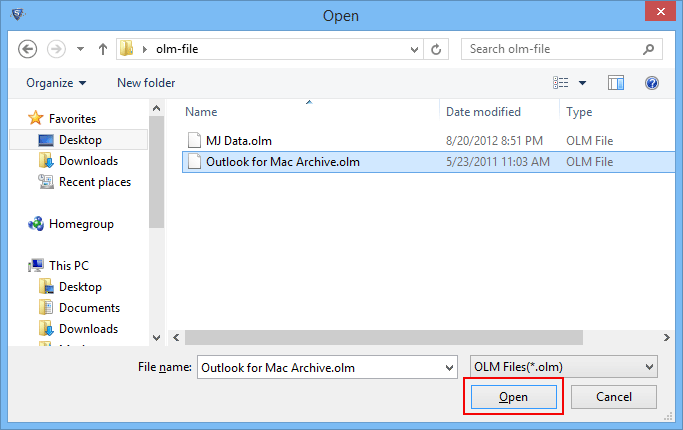 Step 3 : Browse to define the OLM file source location & then click the Open button to join the OLM File to Outlook OLM migration Software. Step 4 : Click on Add File option to begin the file scanning process. Step 5 : Outlook 2011 to PST Converter Software load OLM File and scans it. Click Yes option, if you want to store the scanned outputs as per convenience. Step 6 : When OLM file scanning process completes successfully, you can "Preview" Outlook Emails in the Normal Mail View tab or using Attachments tab. 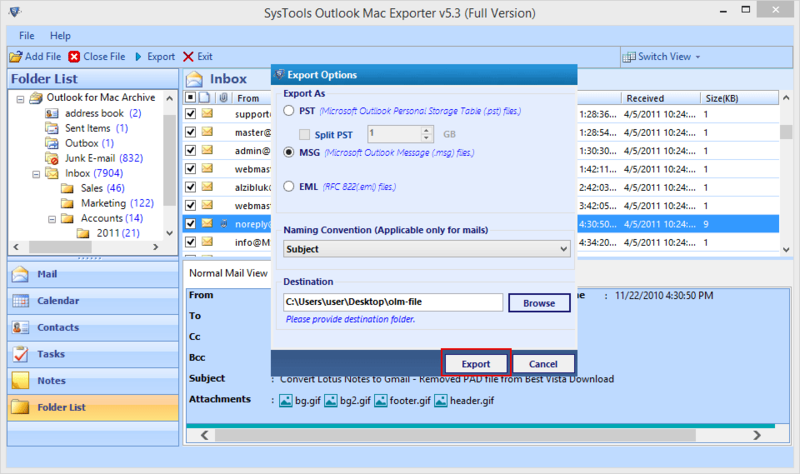 Step 7 : Choose the Outlook emails that you need to export; right-click on that emails and then select the Export option. Step 8 : Now choose the appropriate file format in which you need to export your OLM file. Divide large file through Split PST option if you are converting OLM to PST format. Step 9 : Browse & Choose the destination location and Click the "Export" option to start the OLM to MSG, EML, or PST migration process. Step 10 : Complete Successful Export notification declares the conversion process has completed. Click OK button to proceed further. Step 11 : Enter a name of the report and then Click Save to save the Export Report of OLM to PST, MSG, or EML conversion. Step 12 : Destination of Export Report is displayed on completion of the save process. Click OK to proceed further. Step 13 : Preview the Results to verify the items exported after using Outlook Mac Exporter Software. Navigate to the location where you had stored the PST file. You can easily open PST files in MS Outlook on Windows OS. Q. 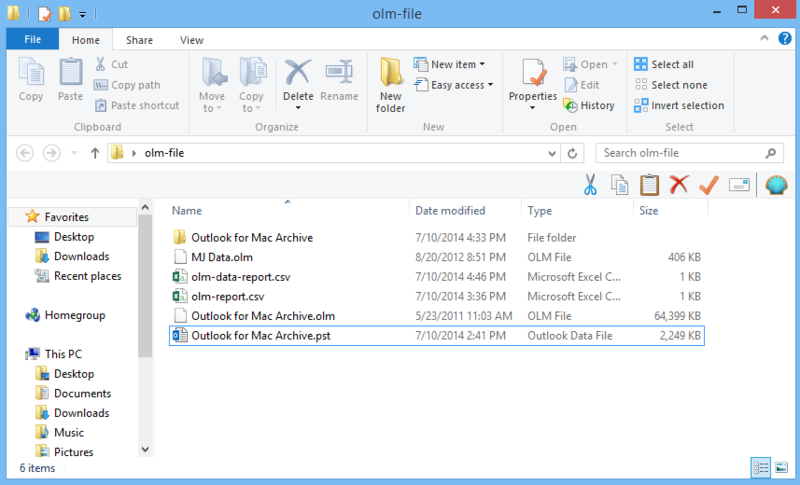 How can I convert OLM files to EML files without Outlook 2011 for Mac? 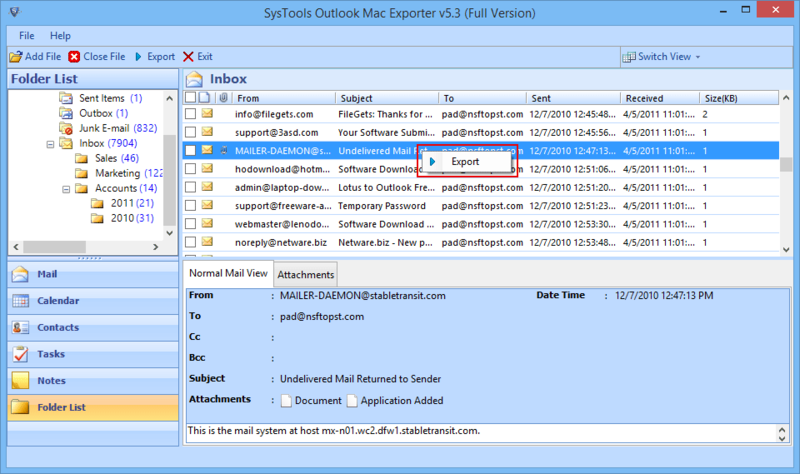 Ans: The Outlook Mac Exporter application is a standalone tool that does not depend on Mac OS X or Outlook 2011, 2016 for Mac. 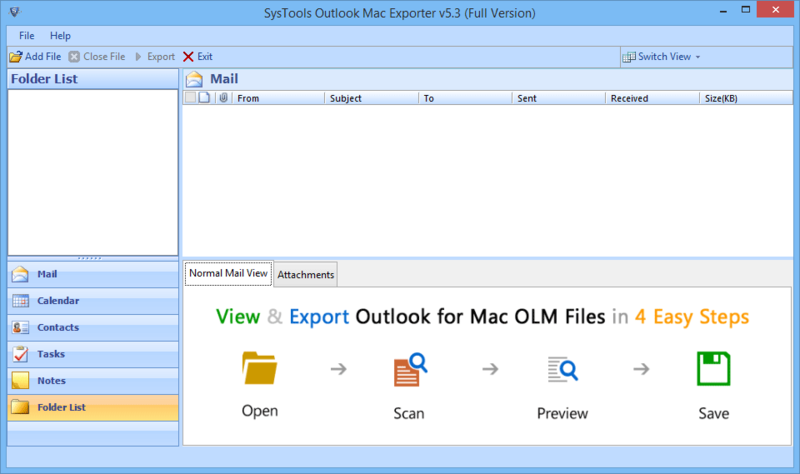 It features to import Outlook Mac OLM to PST, MSG, and EML file. You can choose the conversion output as per your convenience and suitability. Q. 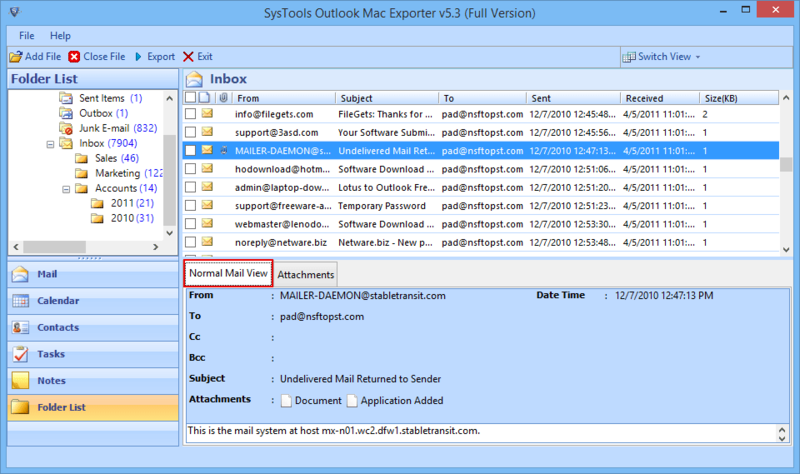 Is it possible to use Outlook OLM files on Mac Outlook for Windows? Ans: The only way to execute such a conversion is using Outlook Mac exporter tool. The software is suitable for the conversion of an orphan OLM to PST, MSG, EML files on Windows platform. Choosing EML file type during the conversion is preferable for using OLM data on Thunderbird profile (Windows/Mac). Note: Outlook Mac Migration Software will get delivered on your registered email id, within few minutes after placing the order. When there is a confusion, I always prefer to go with commercial tools. Outlook OLM to PST converter is built with the precision of transferring the complete profile data of Outlook 2011 for Mac into Outlook for Windows without interfering with the properties of email clients. It is so amazing that the software also provides option to export .olm files to EML and MSG format. I loved the application which helped to export Outlook Mac emails contacts and calendars in Windows Outlook account. It is not only meant for specific data conversion, yet it features the option for selection, splitting etc.. 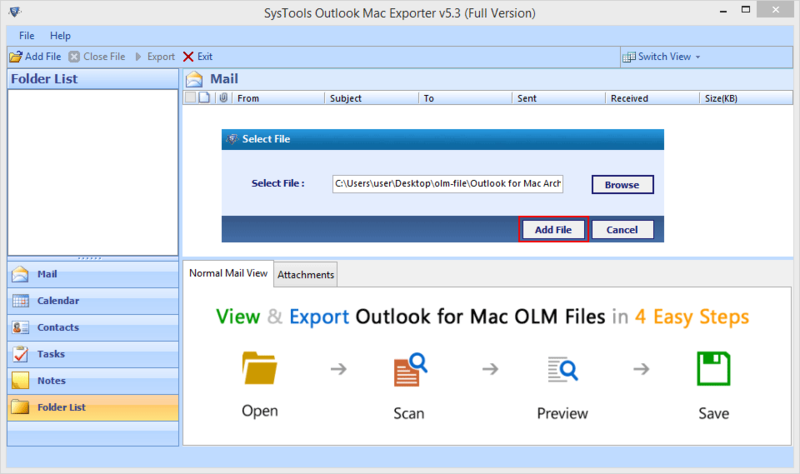 I am so grateful that I found the Outlook Mac Exporter software when looking for the conversion of OLM files to PST.